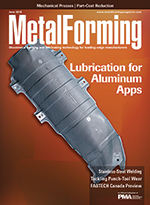 A rising number of metalformers forecast a decline in business activity during the next three months, according to the June 2018 Precision Metalforming Association (PMA) Business Conditions Report. Responses from 109 participating companies reveal steel tariffs as a major factor in the projected decline. Read more. With a ceremonial groundbreaking last week in High Point, NC, attended by MetalForming magazine, Amada America, Inc. ushered in the construction phase for its High Point Technical Center and Manufacturing Center, expected to open in 2020. Company officials expect the campus to employ 200 associates when the facilities become fully operational. Read more. Trumpf Inc. lifted the lid on its expanded training center with a ribbon cutting—more accurately, the cutting of a steel band—earlier this month in Farmington, CT. With a $3 million-plus investment, the company signaled its commitment to training and educating sheetmetal-fabrication customers and employees by adding 18,000 sq. ft. to the facility, which now totals 40,000 sq. ft. Upgrades include an interactive lobby, 14 state-of-the-art classrooms as well as two virtual-learning classrooms, an expanded machine floor for hands-on training, and an expanded, brighter cafeteria. Read more. For startups or smaller companies with more modest production requirements, avoiding the high upfront costs of hard tooling is appealing. 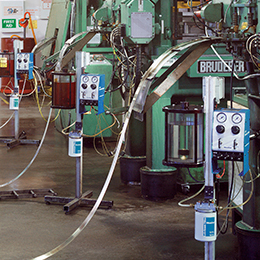 As a result, fabrication alternatives that do not require a high tooling investment, even if the cost per piece is higher, may be the better initial choice. But what happens when demand increases and an OEM must scale up production? Read more. 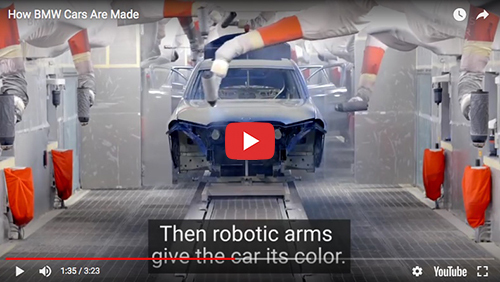 Here, 500 robots and 450 employees work together to build BMWs. Check it out.